Seriously, do not use it. It’s insecure and it occasionally has terrible performance due to its underlying design. Don’t use it. Back in the days of dialup, people used physical circuits like the telephone network to connect to the Internet. On that last hop between the home and the ISP, the protocol that ferried IP directly was PPP, the Point-to-Point Protocol. PPP was designed for an ISP to serve dial-in lines, so it had a bit more to worry about than just ferrying IP packets. It had to assign addresses between the endpoints (IPCP) as well as ensure that Internet service was being given to a paying user by authenticating them (PAP or CHAP). In those simpler times, one physical machine at the ISP’s end would connect to both the Internet and the telephone network. Some people, though, needed so much internet that they wanted to dial in with multiple lines, and have packets routed down both of them. This was known as “multilink PPP” and it had a problem. What if the ISP doesn’t have just one machine handling dial-up connections? It could be the case that a client would attempt to set up a multilink PPP session, but their calls were on different machines, and The Internet couldn’t really route to both of them. So, faced with different PPP servers, the client had little choice but to hang up, dial in again, and hope that this time, they hit the same servers. PPTP was largely motivated by the desire to solve this problem, by splitting Big Machines into two parts: one (or more) to handle dial-in lines, maintaining connections to one (or more?) machines which were actually on the Internet. Handling calls from the clients were the PPTP Access Concentrators, or PACs, which would then deliver traffic to the PPTP Network Server, or PNS. The “tunnel” between these two parts was a single channel/circuit (I presume) that carried the PPTP control traffic and tunneled packets between PAC and PNS for de/multiplexing. 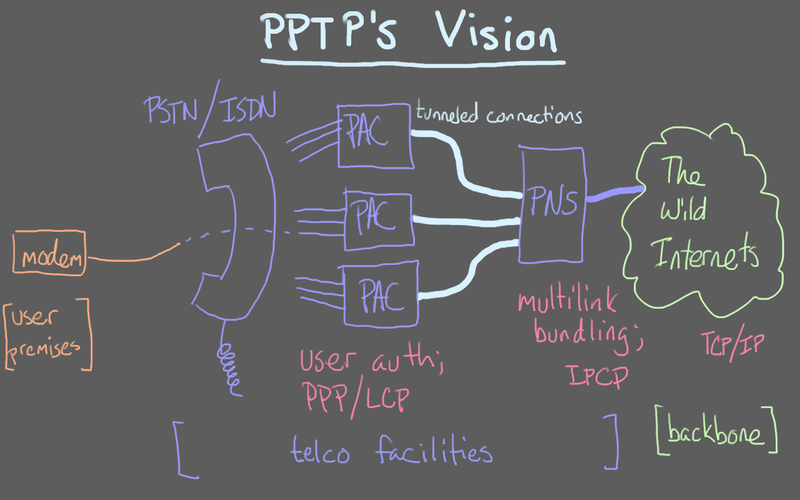 In this scenario, the client-to-PAC connection is still regular PPP; a portion of the PPP exchange (setting up multilink) is forwarded to the PNS, who can then see all client links, even across PACs. Thus, it can route effectively. From the point of view of the Internet, it really is routing all the traffic to one machine, the PNS. The PNS must also handle the IPCP portion of PPP setup, since it’s the server with IP connectivity. Much of the terminology in the PPTP RFC is defined with reference to this situation, and says nothing about VPNs themselves, because the protocol itself was not originally defined as a VPN protocol. However, if the tunnel is encrypted then we can convert it into a VPN technology by moving the tunnel off ISP equipment and onto the public Internet. In this case, the VPN client is playing the role of PAC and the server plays PNS again; the connection between them is a TCP channel over which all network packets are forwarded. Like regular PPP, there are control messages, and also data packets riding on the single established channel. This is where performance trouble turns out to be lurking: if a TCP connection is forwarded, it gets forwarded reliably. It’s never going to be lost on the journey over the PPTP VPN. That inner TCP connection can’t detect the path MTU by packet loss, and this does not play well with systems that self-control their network rates based on packet loss. Someone decided to fix that, so an L2TP connection is carried over UDP packets instead. They implement their own reliability protocol for control messages, and rely on the tunnelled connections to handle any packet loss. That fixes the performance issues facing PPTP. L2TP is also simplified a bit from PPTP, in that it doesn’t offer any encryption of its own. 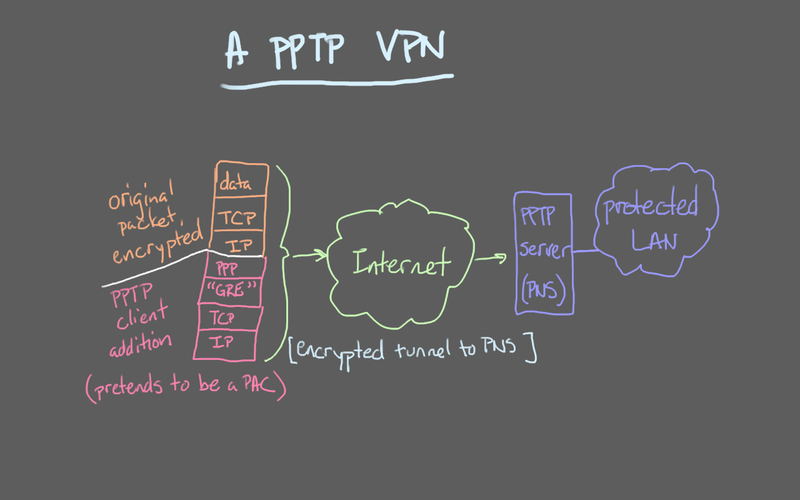 That’s why it has to be run over IPSEC to form a VPN; but otherwise, it’s conceptually near identical to PPTP. 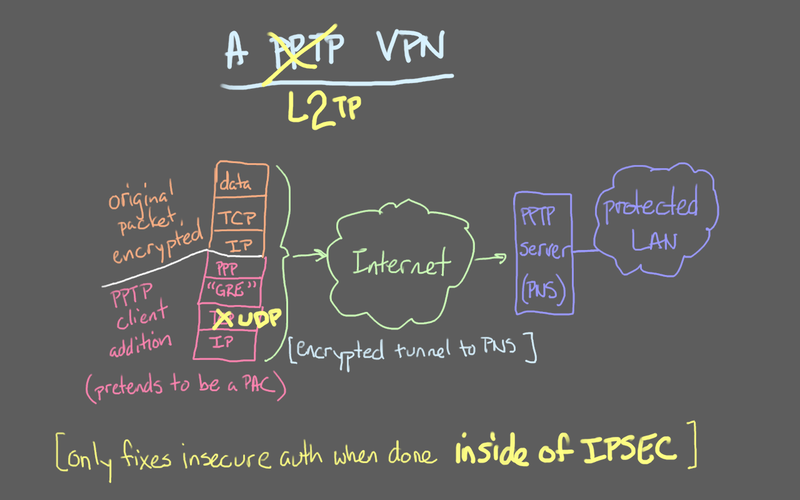 With encryption provided by the IPSEC layer, any weakness of L2TP becomes irrelevant. But it seems like a horrible hack, because IPSEC isn’t concerned with hosts; it’s concerned with networks and routing. Like PPTP, the L2TP RFC is not that worried about defining all this stuff in terms of how an L2TP VPN would be set up in practice. Rather, it reads like a minimal number of changes were made to the PPTP RFC in order to make the required implementation changes obvious to people already writing PPTP VPN software. IPSEC itself establishes an encrypted channel with integrity checking; it’s just anonymous. L2TP provides a point to get a specific username/password pair after the IPSEC key exchange (IKE) is done. If you’re using a pre-shared key (PSK), this oddly means that you need two passwords to connect up the VPN: one site-wide password to establish the IPSEC channel, and a separate per-user password to set up the L2TP tunnel inside. There you have it: VPNs today are generally complicated and awful because people have been adapting other tools to the job, and the layers have just been accumulating. It should be noted that, as long as this post is, it does not cover other approaches to VPNs: it remains laser-focused on L2TP. OpenVPN and sshuttle are out of scope.